You’ll most likely agree, some days it’s tough to swing your legs out of bed and stand up to face the hours ahead. Nancy wrote a blog called One Foot in Front of the Other, sharing her challenges with all of us. She posted a doodle on social media every single day. And she kept speaking at schools and conferences, writing and illustrating books. 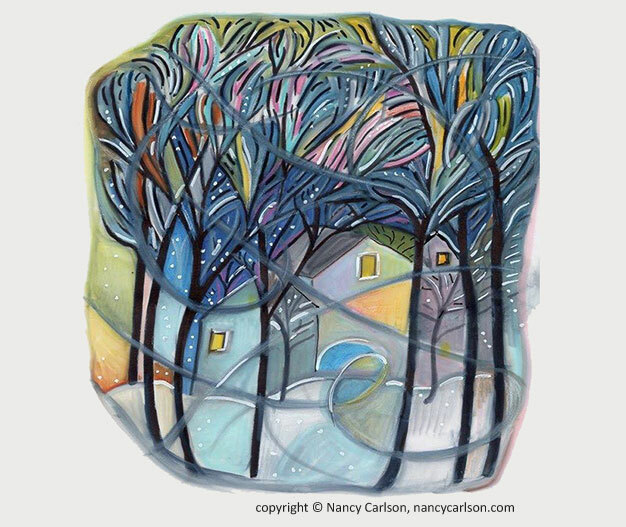 Nancy Carlson’s doodle above, “And we all looked out to God, although He is the color of the wind.” (Laura Nyro lyric) is one of many you can see at her A Doodle a Day: Ten Year Doodle Journey show on exhibit through December 28, 2018, at Artistry in Bloomington, MN. I am grateful for this brave and talented woman, who helps me believe in tomorrow. She is an extraordinary woman. Follow Nancy on Facebook so you can see her work firsthand.